Anil Kumble has stepped down as the coach of the Indian cricket team. This comes after Board of Control for Cricket in India's (BCCI) decided to not renew his one-year contract and invited fresh applications for the post. 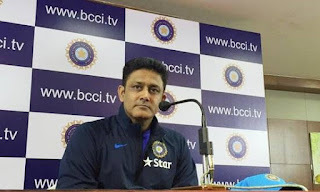 Kumble's contract as the head coach of the Indian team ended on Tuesday after the ICC Champions Trophy and it is understood that he was not interested in an extension. BCCI conform the news with tweet "Mr. Anil Kumble withdraws from the post of Head Coach of the Indian Cricket Team". Kumble, who was appointed as the head coach last year, has had a good run. Under his guidance, India won 10 out of the 13 home Tests with two draws and a single defeat. India also won a Test series comprehensively in the West Indies. Under Kumble, India also won the ODI series against New Zealand and the limited-overs series against England.